If, like me, you're the sort of person that adores the idea of 'glamping' (and perhaps like me, detest the portmanteau) but aren't as keen on those seemingly mandatory activities, then SUJÁN The Serai might be just for you. 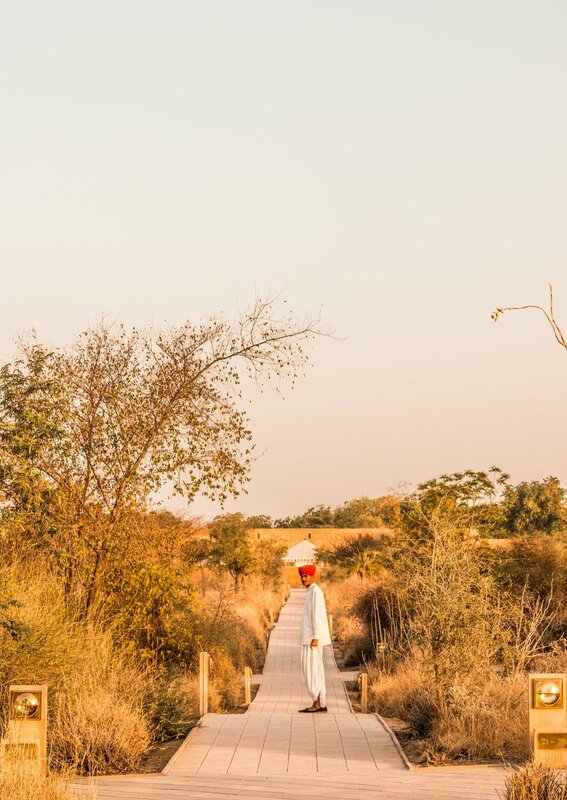 The third luxury tented camp brought to you by passionate conservationists and expert hoteliers, Jaisal and Anjali Singh, it's all about total relaxation. No early morning safari drives here, it's more sundowners by the pool. An hour's drive from Jaisalmer's newly opened airport (making if much more accessible) through the rugged scrubland of the Thar desert. A magical experience, whatever you do don't miss sunset on the dunes. 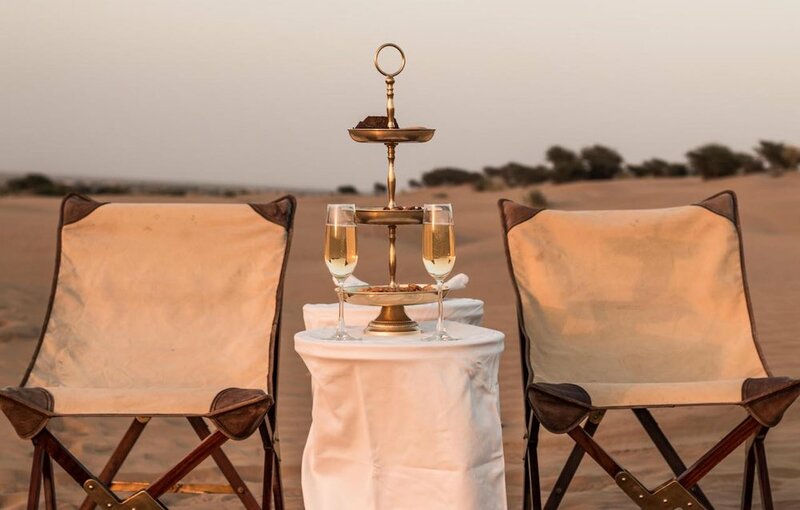 A bumpy four-wheel drive into the middle of the Thar Desert, followed by an even bumpier camel ride, where your dedicated butler will be waiting with a bottle champagne on ice. I mean! 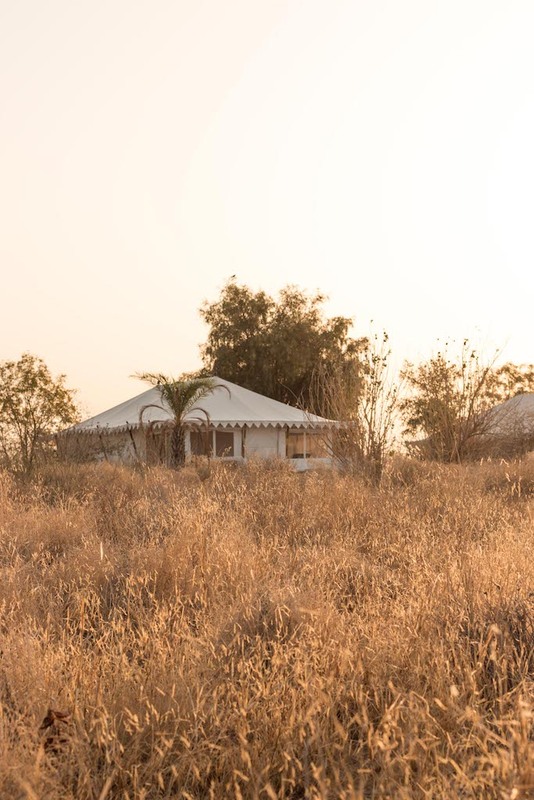 Twenty-one safari style tents, decorated in bespoke wooden furnishings, hark back to the days of the Raj and their travelling caravans. Each one includes an indoor-outdoor tented terrace, with old-world writing desk complete with embossed stationary, leather bound classics, and postcards for the sole intent of writing to all your friends and gloating. Local woven Jaisalmer throws add a splash of colour against crispy white linens and honey-stoned walls. Enormous bathrooms include walk-in showers, twin sinks, are beautiful glass-stoppered bottles filled with hotelier's favourite, KAMA toiletries. A small but perfectly formed menu includes plenty of freshly picked salads and vegetables from The Serai's very own organic vegetable garden. 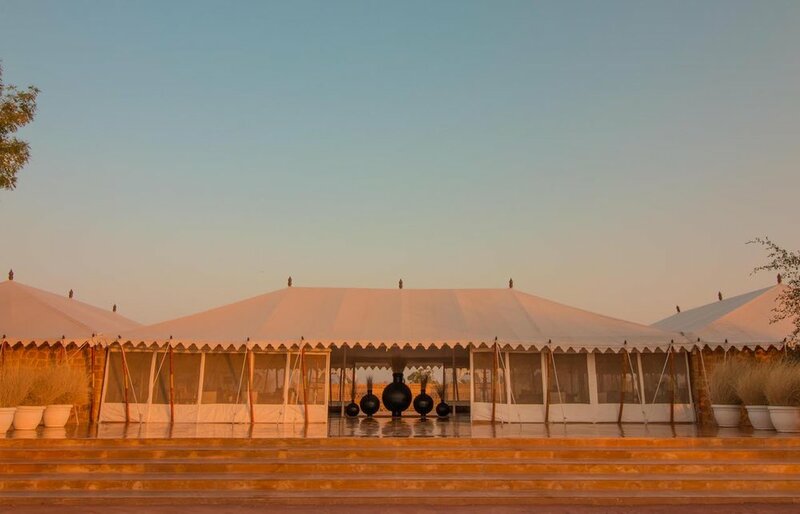 It's a welcome relief to the heavy Rajasthani fair that will probably have been laid on for you during the rest of your travels, and you may well have tired of. There is a token Jaisalmer Thali, made with locally-inspired flavours, otherwise you can enjoy comforting pastas and wood-fired pizzas, Caprese salads, and Australian lamb chops. Their strawberry cheesecake will satiate even the most ardent sweet-tooth. Breakfast, my favourite meal of the day (at The Serai, and in life) is the perfect blend of naughty and nice. Egg white omelette with spinach followed by an aloe vera shooter? No problem at all Ma'am. Full English with accompanying bread basket? How many would sir like? Total luxury, total seclusion. Make sure to come here with either really good company, or a really good book. There's little to do, it's all about the time out. Their four spa tents, with wellness programme's created by Raison d’Etre, aids and abets. Though do make sure to take an afternoon off from being entirely horizontal, and explore the golden city of Jaisalmer and its princely fort. The perfect guest: Rajasthan-bound romantics looking for a bit of downtime after traversing the "Land of Kings"
Best Room: The Royal Tented Suite, of course. Total privacy, with your own private plunge pool and dining tent, who cares that you're right at the far end of the camp. Wi-Fi: Yes. Pet Friendly: Not Room Service: Your very own brass-plated butler button. Rates: From £500 per tent per night. Inc. Breakfast, Exc. Taxes.